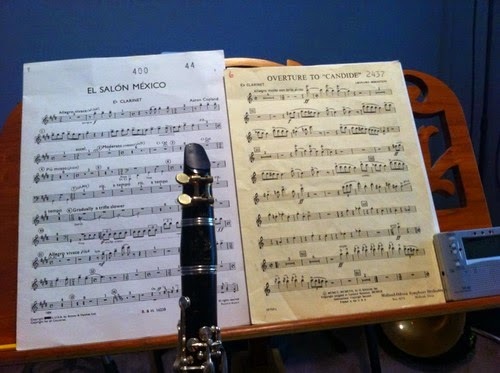 I love playing Eb clarinet and I do not get to do it often enough! I am looking forward to playing a concert with the Midland-Odessa Symphony in a few weeks with Bernstein, Ewazen, Higdon, and Copland on the program. We had a great time playing with the Monroe Symphony last week. The concert went well and we found plenty of great things to eat as usual, including a delicious turtle mocha from The Coffee Bean and a really tasty crawfish po boy from The Pickle Barrel. We ended up going for a run on the levee afterwards since I am still working towards my marathon. Unfortunately, I have a mild knee injury so I am taking a few days off from running hoping that it will heal. This is my first experience with knee problems and it is obviously terrible timing! I ended up changing to the Route 66 Marathon instead of the Fort Worth Marathon because of a gig conflict (musician life!). Cross your fingers for me that a little rest is all I need!